Smart speakers are everywhere these days but, unfortunately, most cannot be taken out and about as they require power from the wall. Thankfully, there’s a small handful of speakers beginning to buck this trend and the UE Blast is one of them. It’s very similar to the UE Megablast, a speaker we rather liked when we reviewed it last year, but a touch smaller and a little cheaper. On the outside, the UE Blast looks fairly unremarkable. In fact, it looks very similar to the venerable UE Boom 2, which has been around for ages. Look at the specifications, though, and something rather special begins to emerge. It’s not only a Bluetooth and Wi-Fi based smart speaker but also one that’s waterproof and offers 360-degree audio. The Blast is very much like the Megablast in terms of the way it looks. It’s cylindrical in shape, comes in a variety of different colours and is IP67 rated, which means it can be submerged for as long as 30 minutes at a depth of up to a metre in fresh water. That’s not the only similarity; in fact, the materials are also carried over from its larger sibling. The top, bottom and a strip along one of the sides are coated in tough rubber, protecting the speaker from damage, while rugged-feeling mesh-type fabric wraps around the rest of the speaker’s body. At the top there’s an illuminated, rectangular power button, which blinks and dims when Alexa is summoned. The small, dot-shaped button beside it is used for pairing the speaker and interacting with Alexa, and flanking these is a pair of large volume up and down buttons. There are no physical play/pause or track skip buttons, though, which baffles me. At the bottom, you’ll find a metal D-ring that can be used to hang the speaker up from a hook or nearby branch or you can remove it to reveal a 1/4in tripod thread, charging contacts and a microUSB port. You can power the speaker via microUSB or purchase the charging base for more convenient charging. That accessory is sold separately for £35. Unsurprisingly, the only difference between the Blast and the Megablast is its size. It has a diameter of 68mm, a height of 188mm and weight of 640g. The Megablast, on the other hand, measures 88mm and 237mm respectively and is considerably heavier at 1.2kg. 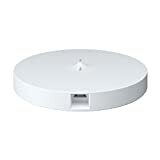 In terms of connectivity, the Blast supports dual-band 802.11n Wi-Fi and can be paired with up to eight different Bluetooth sources. 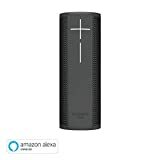 Its Wi-Fi connectivity allows you to connect and stream Amazon’s Alexa services, which include Amazon Music, Tune-In, and Deezer. This means after you’ve setup the speaker through the UE Blast app and signed into your Amazon account, you can access these services with your voice. A particularly handy feature if you don’t have your phone at hand, or for someone in your household to play music while your away. Thanks to an update in early May 2018, the Blast also supports Spotify and Spotify Connect. This means you can use your voice to play Spotify, or alternatively, control the speaker using the Spotify app from afar. A great feature for those who have a large household, or want to remotely play music on their Blast. Unfortunately, Alexa Calling and Messaging still isn’t supported – you’ll need to buy an Amazon-branded speaker if you want to use those features – and I’m also disappointed by the lack of a 3.5mm headphone jack and aptX Bluetoooth codec. Owners of other UE speakers will also want be interested to find that the Blast does not support PartyUp so you can’t daisy-chain it with other UE speakers. As for battery life, Ultimate Ears quotes a 12 hours battery life, which in a real-world scenario might be a little less depending on how much you interact with the speaker. That’s fine, but hardly earth-shattering. And the speaker’s Alexa feature is similarly middling in its performance. I found the far-field microphones on the speaker (similar to what’s found on the Amazon Echo speakers) to be able to accurately pick up my voice in a quiet room from over ten to 15 metres away. However, it struggled when music was blazing through it. I needed to shout at it in before it was able to pick up my voice. For those new to Alexa, Amazon’s voice assistant allows users to ask questions and control various services and devices with your voice. You can ask about the weather and or the football scores and it can also be used to play a specific song from a streaming service, such as Spotify or Amazon Music. The catch is that the speaker needs to be set up and used on a Wi-Fi network for this to work. When you’re out of the house, the smart features are essentially useless. The UE Blast very much has the Ultimate Ears sound signature. It’s a warm-sounding speaker with a strong mid-bass slam and it struggles to bring forward mid-range frequencies. It’s impressively loud for such a small speaker and, better still, it doesn’t distort or clip at max volume. In Catalina by Raekwon these tendencies are exposed to a tee: the bass hits are pronounced and when the speaker is turned up there’s a physical impact to the beat. However, it doesn’t have the same control as the UE Megablast and lacks the extension in the lower frequencies of the Sonos One and the JBL Link 20. Its strong mid-bass presence means the mids are pushed back and recessed and that means vocals aren’t as strong as they should be. Listening to Finesse by Bruno Mars the singer’s voice is more subdued than it should be. The highs also lack a little energy, there’s more noticeable roll off at the top end and it sounds a little softer than its larger sibling as a result. As for soundstage, the UE Blast shares the same 360-degree audio characteristics as its Megablast so no matter where you’re sitting in the room the music sounds the same. Instrument separation, however, could be a tad better. Again, when compared to the Megablast the Blast sounds slightly congested. I guess that’s the price you have to pay for the Blast’s smaller size. Overall, though, the Blast sounds good. It’s sonically better than the Amazon Echo 2, the Echo Plus, the JBL Link 10 and the UE Wonderboom. However, when compared to the more expensive Sonos One and UE Megablast it’s outclassed in more ways than one. Oh, and in case you were wondering, it sounds practically identical to the UE Boom 2. At the time of writing, the Blast only costs £150. That’s significantly lower than its 2017 launch price of £200 but even at this reduced price, the UE Blast faces a lot of competition. The UE Megablast is a brilliant deal right now at £180, and does all the same stuff as the Blast but sounds better. If portability isn’t important to you then the impressive Sonos One speaker can be yours for £200; it has Alexa built-in and a powerful set of drivers that deliver excellent sound quality. Keeping all things Amazon, there’s the 2nd generation Amazon Echo costing £90 and its larger, more capable sibling, the Echo Plus at £140. If you aren’t interested in smart features, Ultimate Ears has the waterproof UE Wonderboom at £58, down from £90 and the UE Boom 2 at £100, which looks just like the UE Blast but doesn’t have Amazon Alexa built-in. At £150, the UE Blast is the cheapest, most versatile smart speaker on the market. No other speaker is this rugged and waterproof, has Bluetooth and Alexa compatibility. It’s compact, too, and although it doesn’t sound as good as its bigger sibling, the UE Megablast, sound quality isn’t bad at all. In short, the UE Blast is an excellent smart speaker. For mere £10 more than the Boom 2, you’re getting an Amazon Alexa-enabled device, and its rugged design and sheer audio power.